This great ship of a church sits hard against the village high street, raised up behind a wall: it is an urban setting. The contrast between nave and chancel is interesting, a curiosity: the retopped tower and nave are familiar, a grand late medieval church with aisles and clerestory, but the chancel is an earlier one, a big Early English structure, also with a clerestory. The south side is faced, but the east end is a great chequerboard expanse, in which the the three lancets seem tiny, and so low as to be out of proportion. Was the roof raised at the time the nave was built, perhaps, and the clerestory added? Or was it always intended to rebuild, but the Reformation intervened? The dedication is also a curiosity. 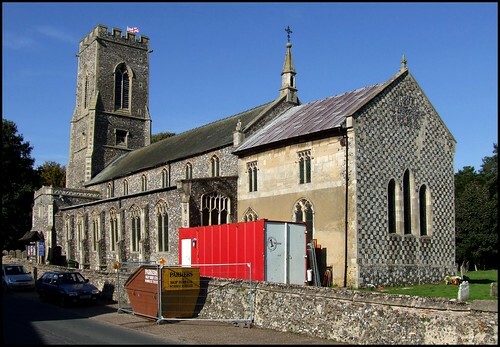 The St Faith in the village name comes from the Priory of St Faith, established here by Robert Fitzwalter after a pilgrimage to Santiago de Compostella in the years after the Conquest (legend says that he tried to build it first at nearby Horsford, but it fell down). Part of the Priory survives as a private house. St Mary and St Andrew is clearly not a possible medieval dedication, but in the south porch vaulting, a boss shows the crucifixion of St Andrew. Coming here in the autumn of 2008, we found scaffolding up, and a big programme of refurbishment in hand, including the building of a meeting room and kitchen at the back of the church. However, it was still clear what a magnificent interior this is. It wasn't possible on that occasion to see the church's famous Jacobean font cover, but I shall add a photograph of it when I revisit. Some apologetic but welcoming ladies were cleaning the nave for a wedding, and so we stepped carefully over buckets and mops to take a look at the great treasures of the church, the painted Saints on the rood screen dado and pulpit. They are like no others in East Anglia, and although they have been restored, particularly those on the pulpit, they show that here was a devotion to some rather unfamiliar Saints, and with some exotic iconography. The panels on the pulpit appear earlier than those on the screen - or, at least, most of them do. One appears to have been painted by the same hand as the screen. The dedicatory inscription of the screen gives a date of 1528. If the pulpit was about 1480, but unfinished, it would explain the odd panel out. Figures of note include St Catherine of Sienna, St Bridget of Sweden, St Oswald and St Faith, as well as the more familiar St Etheldreda, St Apollonia, St Lucy, St Helen , St George, St John and St John the Baptist. The panel of the Blessed Virgin and child on the pulpit depicts a monk kneeling at her feet. Was he the donor, or does he represent the inhabitants of the Priory? In recent years, the local Methodists have moved in with the Anglicans here, holding joint services. This is the kind of thing which is likely to happen more and more in the years to come, particularly in Norfolk, where there is a strong Methodist tradition. I have already observed that the setting of this church is urban in character, and much the same could be said for the inside, but also in a good way. The Victorians matched grandness for grandness, but there are other medieval survivals, including some good benches in the chancel. The 19th Century furnishings of the nave, however, are less satisfactory, giving a rather crowded feel. How those great arcades pine for simple wooden chairs beneath them! A curiosity at the west end of the south aisle is that the last bay was replaced in Victorian days with a sweeping staircase up to the porch parvise - Dr Pevsner described it as romanticised medievalish, which I think meant that he didn't like it. When you visit a church like Horsham St Faith's, you can't help recalling that we are within a few miles of what was, in late medieval days, the second city of England, and one of the great regional capitals of Europe. But there was a church here long before that, of course, for we have already mentioned the Norman Priory. This is, as I have said, now a private house, but it is occasionally open for viewing, and contains what Pevsner called the most impressive mid-13th century scheme of wall paintings in England. As well as the story of the Fitzwalters adventures which led up to the founding of the Priory, it includes a magnificent rood group, and a wonderfully fresh figure of St Faith herself, excavated in the 1960s. The story of the Fitzwalters' journey to Spain, and their return to build the Priory, includes a wheelbarrow, which Pevsner notes is one of the earliest depictions of this Chinese invention in western art.